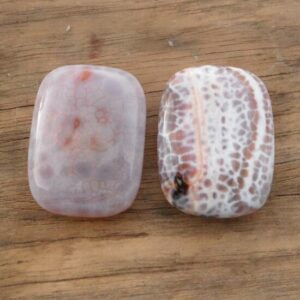 Fire Agate, sometimes called Tortoise Shell Carnelian, assists with manifestation work and is especially helpful with all aspects of creative expression. It allows spiritual insights and inspiration to be grounded in to the physical realm. Stamina and physical vitality are stimulated, bringing with it an improvement in circulation, thus warming the body.